A. He was of the tribe of Benjamin. B. Benjamin was the son of Rachel (Gen. 35:24). 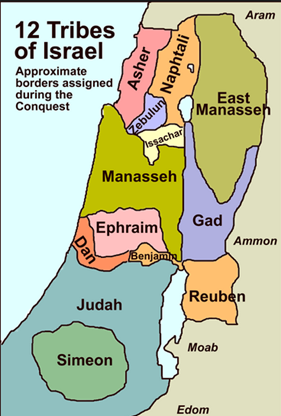 C. This tribe was the smallest of all the tribes of Israel (I Sam. 9:21). D. The location of their land. A. Aphiah was of the house of Becher the son of Benjamin (Gen. 46:21). 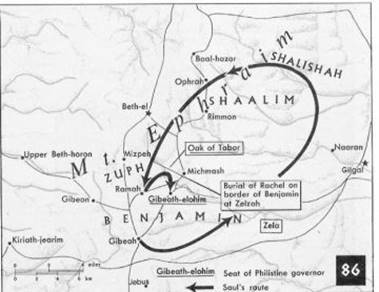 B. Abiel is also Jehiel, the first settler of Gibeon (Gibeah) (I Chron. 9:35). He married Maachah, a daughter or granddaughter of Caleb. …a mighty man of power. …a choice young man, and a goodly: and there was not among the children of Israel a goodlier person than he: from his shoulders and upward he was higher than any of the people. And the asses of Kish Saul’s father were lost. B. We see here the providence of God at work. It is through natural means that God brings Saul into the presence of Samuel. …And Kish said to Saul his son, Take now one of the servants with thee, and arise, go seek the asses. This map was scanned from The MacMillan Bible Atlas; 3rd Edition; Aharoni, Avi-Yonah, Rainey, and Safrai; MacMillan; ©1993 by Carta; p. 70. …Saul said to his servant that was with him, Come, and let us return; lest my father leave caring for the asses, and take thought for us. A. He was concerned for his father. B. Here we are given more insight into the positive qualities of Saul. He was both obedient to his father and had a deep concern for him as well. And he said unto him, Behold, now, there is in this city a man of God…he can show us our way that we should go. B. It was a “title of respect applied to prophets and beloved religious leaders.” (…Wikipedia.com, “Man of God”). C. The term appears 78 times in 72 verses of the Bible, in application to up to 13 individuals. Then said Saul to his servant, But behold, if we go, what shall we bring the man? For the bread is spent in our vessels, and there is not a present to bring to the man of God: what have we? A. He as concerned that they did not have a gift to bring the man of God. B. It was not required that a person pay a prophet. However, it was a custom for one to bring a gift to an individual who was thought to be a superior. A. The shekel was about ½ oz of silver. B. The servant only had ¼ part of a shekel. Thus, he only had about 1/8th oz. of silver. C. 1/8th of an oz. of silver today would be $1.92. It was probably much less in Bible times. D. “…and here the fourth part of a shekel of silver, about nine pence of our money, was deemed sufficient: therefore the present was intended more as a token of respect than as an emolument” (Clarke, e-sword). E. In all of this, we see the hand of God in play. 1. Why did Saul choose this particular servant to go with him? 2. Why couldn’t they find the donkeys? 3. How did the servant know about the man of God? 4. Why did the servant still have ¼ of a part of a shekel of silver with him? C. This is a parenthetical remark by the author that explains the word as it will be used in the next few verses. B. This is not the city of Ramah, Samuel’s home. Saul had come specifically to this particular city in order to offer sacrifice for the people. B. The young women were not kept in the house. They often went to draw water for their animals (Gen. 29:6), and, they worked in the fields (Ruth 2:2-3, 8). B. They could have been drawing water for personal use, home use, or to be given to their animals. And they answered them, and said, He is: behold, he is before you: make haste now, for he came today to the city; for there is a sacrifice of the people today in the high place. A. He had come to make a sacrifice. B. We are not told all of the details of this sacrifice. B. Altars were usually built upon higher elevation. 1. These were often high places located outside of the city itself. 2. The high place was called the acropolis: acro (high) and polis (city). Thus, an acropolis was the high part of the city. And as soon as ye be come into the city, ye shall straightway find him, before he go up to the high place to eat: for the people will not eat until he come, because he doth bless the sacrifice; and afterwards they eat that be bidden. Now therefore get you up; for about this time ye shall find him. A. The people would not eat until Samuel blessed the sacrifice. B. There were certain rites that only a priest could perform in order to bless the sacrifice and the meal that was about to be eaten. 3. T – F The Lord had told Samuel about Saul the day before they met. (I Sam. 9:15). 4. “…and thou shalt _______________ him to be ____________ over my people Israel” (I Sam. 9:16). 13. T – F Samuel did not tell Saul anything about the asses that were lost (I Sam. 9:20). 19. T – F Samuel had set aside a particular portion of food. (I Sam. 9:24).